Glencairn Museum News 25.2 (2003): 13. 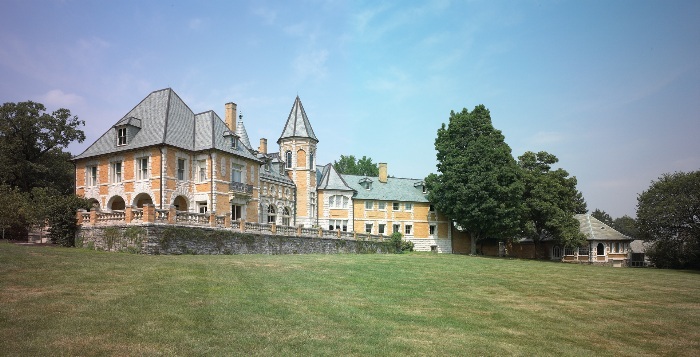 Cairnwood, the home of John and Gertrude Pitcairn, was dedicated on May 22, 1895. 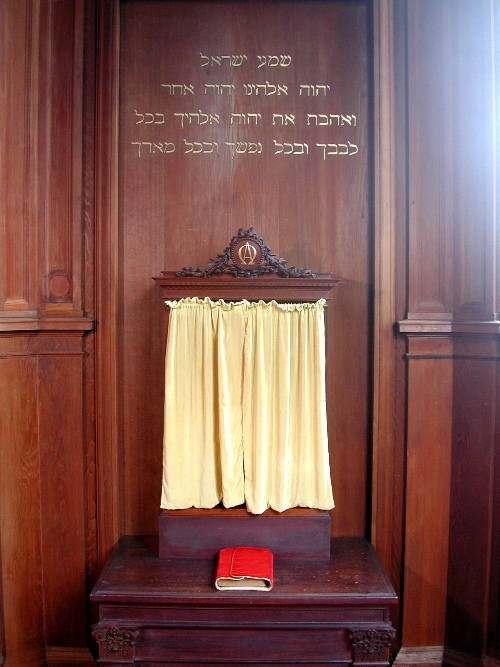 During the dedication service, the Word and volumes of the Writings were placed in the chapel's repository, and also in the private rooms of members of the family and household staff. Click on image for a larger version. "Family worship is not quite so general and uniformly maintained by families of the General Church as was the case some ten or fifteen years ago." These words, taken from an article in New Church Life, were written by a member of the Glenview society nearly one hundred years ago, in 1905 (NCL 1905, p. 19). Family worship was a frequent topic of discussion in the General Church at the turn of the 20th Century. In 1904, a pastor in Canada observed that family worship had once been so common that "scarcely a family did not have it." But the practice had begun to decline. According to the pastor, "The lack of regular family worship is a deplorable thing, and the Church needs to rouse itself to realize the danger which lies in its neglect. If the present condition continues and grows, it means the decline and passing away of this Church" (NCL 1904, p. 157). At a local assembly in Bryn Athyn in 1899, a spirited discussion took place about how to revive the custom of family worship. John Pitcairn was one of those who took part. According to New Church Life, "Mr. Pitcairn mentioned the necessity of guarding against making the readings in worship too long; he also noted the use of singing, in awakening the affections. Individually we might well be guided by Swedenborg's own rule of life, 'Often to read and meditate upon the Word of God,' and read one or two chapters daily" (NCL 1899, p. 170). Cairnwood viewed from across the lawn. The family chapel is at the top of the octagonal tower, placed at the highest point in the house and designed so that worshipers face east. Click on image for a larger version. By the time Pitcairn made these comments his family had been using their chapel at Cairnwood for four years. 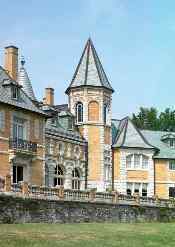 Cairnwood, the personal estate of the Pitcairns, took three years to build and was completed in 1895. The most striking feature of Cairnwood, when viewing it from across the spacious lawn, is an octagonal tower with a high pitched roof. At the top of this tower is the family's chapel, placed at the highest point in the house and designed so that worshipers would face east. 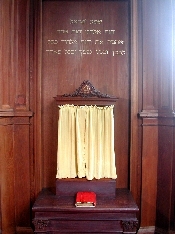 The Cairnwood chapel is entered between two columns of wood, beneath an architrave painted with the words of the familiar passage from True Christian Religion 508: Nunc licet intellectualiter intrare in arcana fidei ("Now it is permitted to enter with understanding into the mysteries of faith"). The room includes space for an organ, and the walls are lined with California redwood. The ceiling is finished in blue with ribs of gold. 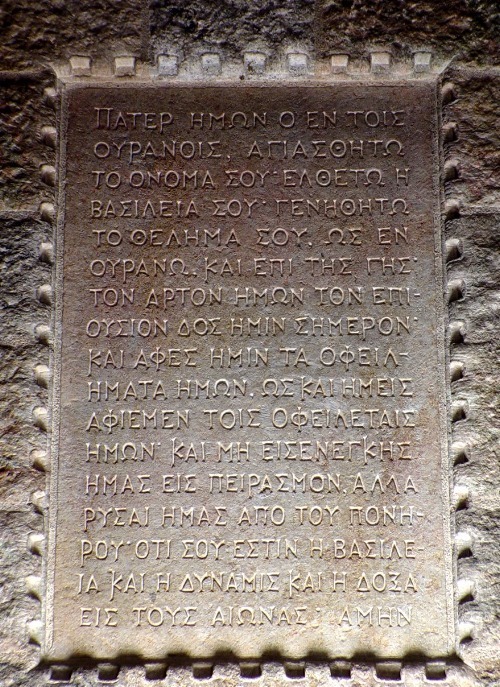 The wall above the repository for the Word is carved with alpha and omega, the first and last letters of the Greek alphabet. (In Revelation 1:8 the Lord says "I am the Alpha and the Omega, the beginning and the end.") 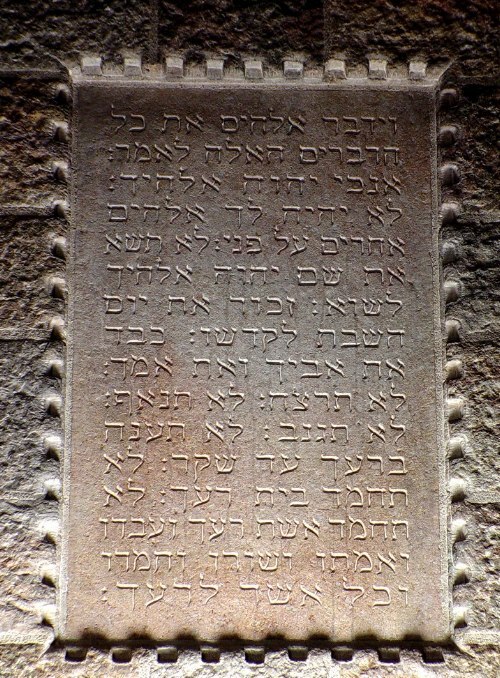 Beneath this carving the wall is painted with a Hebrew inscription in gilded letters. The text is Deuteronomy 6: 45, "Hear, O Israel: The Lord our God, the Lord is one! You shall love the Lord your God with all your heart, with all your soul, and with all your might." 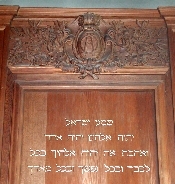 Alpha and Omega carved on the wall above the repository in Cairnwood, with the Hebrew inscription from Deuteronomy 6: 45 below. Click on image for a larger version. A morning prayer has survived that John wrote himself, and perhaps recited while kneeling in the chapel at home. As for family worship, nothing is known about how it was conducted while John and Gertrude's children were young. But when their son Raymond married Mildred Glenn in 1910, the couple moved into Cairnwood and raised their children there. Quite a bit is known about how this new generation of Pitcairns conducted family worship during their years at Cairnwood. After breakfast, those of Raymond and Mildred's children who were not old enough to go to school would have worship in the chapel with their mother. After lighting candles, Mildred would read a story from the Word. She would then tell the story again to the children in simpler words, and take out The Royal Scroll. The Royal Scroll was a panorama with paintings of Bible stories by the world's great artists reproduced on a single continuous scroll. 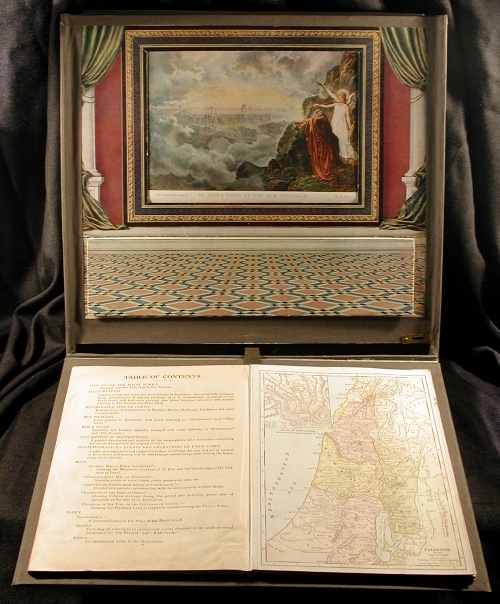 It was produced in 1904 by the Home Herald Company, and also included maps of the Holy Land and Bible study notes. The paintings would appear through a window when turned with a key. There were 132 paintings in all, and each child would be allowed to turn the key and discover one picture per day. Even fifty years later one of the children would recall, "Oh, we loved that . . . that was a wonderful thing." At some point the simple flat key that came with the set was replaced with a handmade version, crafted in monel metal in the Bryn Athyn workshops. 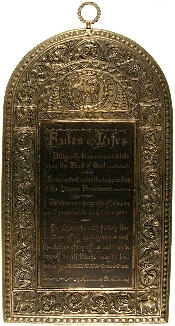 A plaque with Swedenborg's "Rules of Life," also of monel metal, hung on one of the walls of the chapel. Sometimes Mildred would play the little organ located in the niche at the back of the chapel. The children learned many hymns, including some in the original Hebrew. 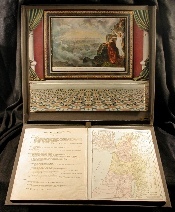 The Royal Scroll, a panorama with paintings of Bible stories, was used as an aid to family worship for the younger children in Cairnwood. Click on image for a larger version. Monel plaque with Swedenborg's "Rules of Life," which originally hung on one of the walls of the Cairnwood chapel. The plaque was created by John Joseph Walter who also did metal work for Bryn Athyn Cathedral. Click on image for a larger version. 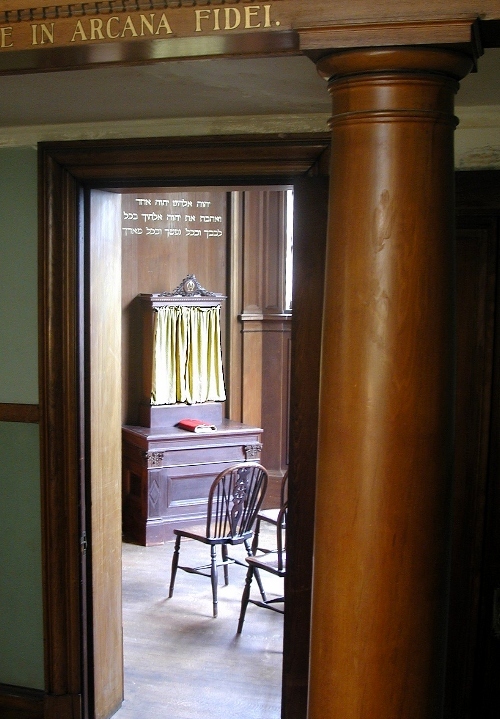 The Cairnwood chapel's repository came from the Pitcairn home on Spring Garden Street in Philadelphia, where it hung on the east wall of the living room (see photo below). 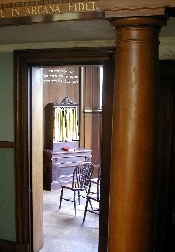 The repository was specifically made for the Pitcairns, and even though it was not yet finished at the time of the home's dedication in November of 1886, its place in the living room had already been determined. "The Chancellor opened with an appropriate address concerning the use of a New Church home, following which he requested Mr. and Mrs. Pitcairn to indicate the place where they wished to have the Repository for the WORD. They did so by lifting a small table from a central position in the room and placing it against the east wall, in lieu of the Repository, which was not yet ready (College Letters, December 10, 1886, 3)." It was used in the Cairnwood chapel for many years until it was moved to Glencairn, perhaps in time for the dedication service on December 29, 1938. In December 2005 it was restored to its original location in Cairnwood. It is not known who made this repository, which is now more than one hundred years old. John and Gertrude Pitcairn, and their first child Raymond, moved into a house on Spring Garden Street in Philadelphia in the fall of 1886. They lived there for nearly ten years, until they moved "out to the country" and built Cairnwood. A repository was specifically made for the east wall of the Spring Garden living room (see photo above), although it was not quite ready at the time of the home's dedication in November 1886 (College Letters, Dec. 10, 1886, 3). It was later moved to the Cairnwood chapel. Photo: John and Gertrude Pitcairn Archives. Click on image for a larger version. 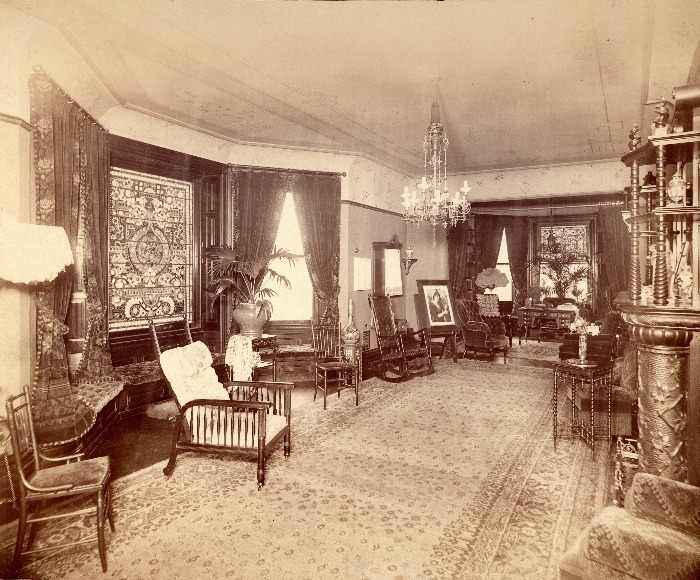 This repository, originally located in the Pitcairn home on Spring Garden Street in Philadelphia (see photo above), was moved to the Cairnwood chapel in 1895, and later to the Glencairn chapel in 1939. In 2005, after an extensive renovation of the Cairnwood chapel, it was restored to its earlier location in Cairnwood. It is not known who made the repository, which has now been used continuously for more than one hundred years. Click on image for a larger version. In the evening after supper at Cairnwood, the whole family, along with any household staff who wanted to attend, would gather downstairs in the living room for worship led by Raymond. Hymns would be sung here, too, but unaccompanied by instrumentation. There was a repository with a copy of the Word downstairs as well, to the left of the fireplace; this repository was designed by Winfred Hyatt in 1914 at Raymond's request, specifically for use in this room. In 1922 Raymond Pitcairn read An Appeal to the World for a Chapel in Every Home, a booklet published in Philadelphia by Joseph Robert Wilson. A copy of a letter from Raymond to the author has survived, dated September 8, 1922: "You may be interested to know that at the time my father built the house in which we now live, the house was planned to include a chapel. Among New Church people it is quite customary to have at least a repository, placed where possible on the east wall, which contains a copy of the Bible and the books of our Revelation, and is used in daily family worship" (Raymond and Mildred Pitcairn Archives). Perhaps at this time Raymond was already thinking about the chapel he would build for his own family several years later at Glencairn. Worship was held in the Glencairn chapel each evening for the family and household staff. Photo: Christopher Smith, TDI Productions. Click on image for a larger version. 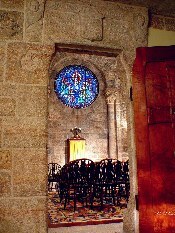 The family chapel at Glencairn is hexagonal in shape, located at the top of the east wing and, like the Cairnwood chapel, is situated so that worshipers face east. Both the repository and the organ came with the family from Cairnwood to Glencairn. As at Cairnwood, visitors to the Glencairn chapel pass beneath the inscription from True Christian Religion 508 ("Now it is permitted . 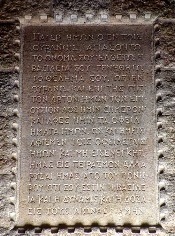 . ."), but this time in English translation, and carved in stone. 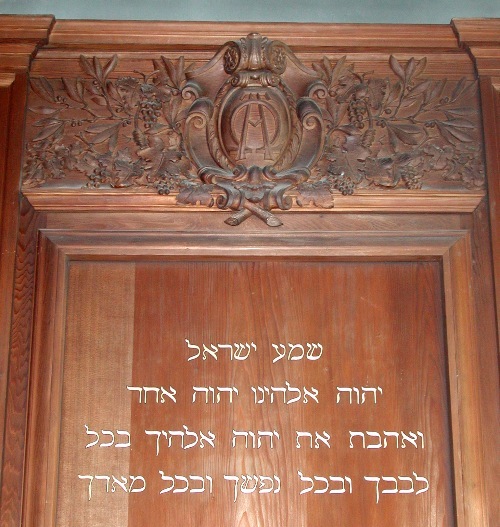 The teakwood door is carved with a large cross, with the letters alpha and omega interwoven at its center. As with the Cairnwood chapel, there is an inscription in Hebrew on the wall (this time an abbreviated version of the Ten Commandments), but at Glencairn there is also an inscription in Greek (the Lord's Prayer). The two side walls hold stained glass windows inside Gothic arches: the south window shows scenes from the Lord's advent based on originals in Poitiers Cathedral in France, while the north window depicts scenes from His resurrection. The east wall, above the repository, features a large round window portraying the Lord sending out His twelve disciples on June 19th, 1770, representing the birth of the New Church. The chapel's ceiling is a striking depiction of the four creatures of the Apocalypse in glass mosaic. The latter two windows and mosaic were designed by Winfred Hyatt. 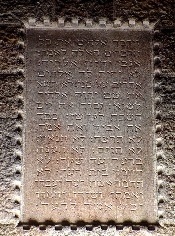 On the left side of the wall in the Glencairn chapel, an abbreviated version of the Ten Commandments is carved in Hebrew, and on the right side the Lord's Prayer in Greek. Photos: Christopher Smith, TDI Productions. Click on the images for a larger version. By the time the Pitcairns moved into Glencairn in 1939, most of the children were in their teens and twenties, and family worship now only took place in the evening. After the dishes from the evening meal were washed, a button was pressed in the kitchen that rang chimes throughout the building. This was the signal for the family, and any household staff who wanted to participate, to gather in the chapel. Raymond led the service, which included the Lord's Prayer, readings from the Word and the Writings, and the singing of hymns a capella. Recent oral history interviews reveal that Raymond and Mildred's children continue to have very fond memories of the family worship services held at both Cairnwood and Glencairn.